By now, most business people, pundits, and politicians in the United States and other developed nations have come to grips with the phenomenon of manufacturing jobs moving offshore: The process is variously referred to as "outsourcing" or "offshoring. " But a far bigger wave of change is approaching the shores of those same developed nations: the globalization of services. Where are the jobs going? Which companies benefit –– or could benefit? How exactly does services offshoring work? How do you "get in the game"? Who makes a good partner? And what are the policy implications? The Services Shift answers all these questions, and more, offering powerful insights for managers, public policymakers, and citizens alike. How to embrace the new revolution in services offshoring. Where services offshoring is happening today, what’s coming next and how to profit from key trends. 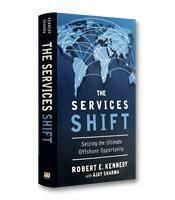 How to prepare for the massive financial and political implications of services offshoring. How to define the right global-sourcing strategies for your service business. How to thrive in the world of services offshoring, where everything from HR management to emergency medicine can be provided from half a world away.